A former United States Marine, graduate of the University of Richmond, and retired insurance executive, Bob Berger has developed his talent of painting in watercolor in a manner unlike most artists of this medium. A detail oriented painter who is challenged by intricate subjects, his works reflect the detail he applies to each piece. Travel came early to Bob Berger who, beginning at the age of seven, would take a train from Baltimore, MD. to Chicago, IL. each summer, alone, for family visits. Trains have always been a love of his and are featured in a collection of paintings of steam locomotives from the past. 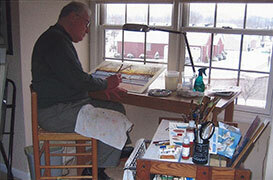 While interest in travel came early to him, painting came late, as he took his first watercolor class in 2003. Throughout his busy life he's developed a talent for illustration and calligraphy. European travels, cruises and various other means of seeing the world allowed him a treasure chest of subjects to paint as he developed his talent. Historical oil paintings and a deep interest in Biblical study have also become subjects of his work. Bob has completed a collection of watercolor paintings based on original oils, that show European cities in the early sixteenth century. Due to the nature of the original oils the work has to be extremely exact. After living in Florida for forty-one years, Bob and his wife moved to Berea, KY. in 2006 where he has been able to expand and develop his work in a truly artistic environment. Mostly self taught, Bob has studied with Terry Maddon, Mitchell Tolle and Joe Fettingus. He presently teaches watercolor and calligraphy classes in Berea.